If you’re a regular to Pinterest you might have come across this: spammy Best Buy, Starbucks, or Walmart gift card pins – or perhaps pins advertising diet pills. Some of them are labeled as Pinterest giveaways, but they’re definitely not legitimate. Do NOT click the links! Maybe one ended up in your own stream. It seems that the pin is not deletable, but there is a way to remove it. Open the pin, type “edit” after the end of the pin URL (e.g. 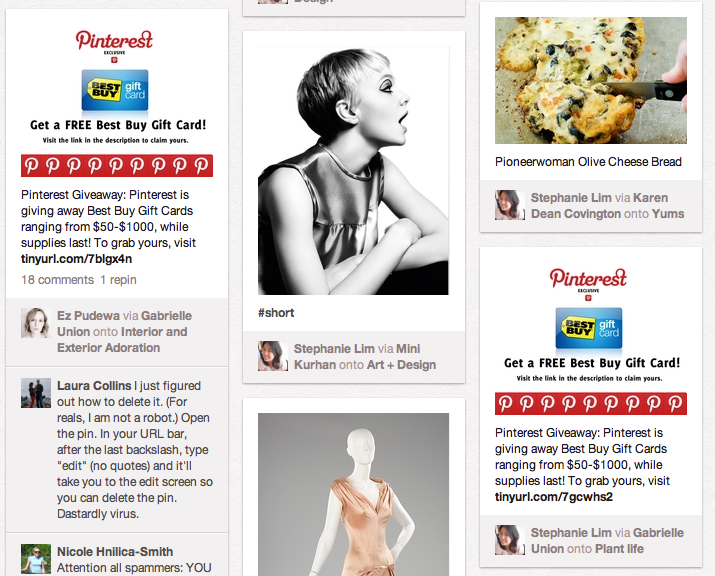 http://pinterest.com/pin/5555555/edit), and it will take you to the pin edit page. You can delete it from there. Also, it may appear under your “Likes”. Just be sure to unlike the pin. Again, do NOT click the link in the pin! I don’t know where it goes, but I suspect it can bring nothing but trouble. Where did these things come from? I’m not sure, but it looks like the spammers were using a script to propagate the pins automatically throughout Pinterest. Interestingly, you don’t need to actually click on the pins for them to show up in your stream. To be on the safe side, after you delete the pin, clear your browser cache, cookies, etc. completely and reset your Pinterest password. It’s always a good idea to run a virus scan, too!